Now that you’ve decided to install solar PV panels, you’ll need to find a professional solar panel installer who is accredited by the Microgeneration Certification Scheme (MCS) to carry out the installation. At Solar Guide, we highly recommend obtaining 3 quotes from MCS accredited solar panel installers, who will visit your property to determine whether solar photovoltaic panels are going to be suitable. By sourcing 3 quotes, you’ll get the best possible advice and price for your solar installation so you can achieve the best possible payback. It is extremely important to employ the services of an MCS accredited solar panel installer. If you don’t, you won’t be able to benefit from consumer protection which the MCS scheme provides as it is a mark of quality. MCS – which stands for the Microgeneration Certification Scheme – is supported by the Department of Energy and Climate Change (DECC) and is an independent scheme which certifies microgeneration products, such as solar PV panels, and the companies that install them. All Solar Guide solar installers are MCS accredited and are members of the Renewable Energy Assurance Limited (REAL) Assurance Scheme. Unfortunately, there are some disreputable ‘solar companies’ out there promising quick installation at very cheap prices, but they should be avoided at all costs. As we’ve mentioned you should never hire a solar installer who is not MCS accredited as you’ll miss out on the quality assurance and consumer protection which the scheme provides. The best way to avoid dodgy solar companies is to do as much research as you can and compare quotes from multiple installers. If one quote appears to be a lot cheaper than the others this is something which should be challenged as it could indicate they are using poor quality technology or performing quick installations. It’s also a very good idea to discuss the warranty included with the panels and what after care services they provide. You don’t want to have solar panels installed by a company which disappears as soon as they’re on your roof. Take a look at their websites and ask for testimonials from former customers to ensure they’re a reliable company with a good track record. All Solar Guide installers are vetted to ensure they are MCS accredited and regularly monitored for positive customer feedback; you can get free, no-obligation quotes for solar panels from MCS installers in your area by completing our simple enquiry form. The solar panel installer who visits your property will be able to advise you with regards to the right sized system to meet your needs. Generally speaking, the size of your system will be determined by your electricity usage and the roof space available for the installation of the panels. Therefore it’s handy to have some energy bills available for the surveyor as a point of reference when they visit your property. Small-scale residential solar panel systems fall into the 0-4kWp capacity banding and account for the largest number of installations in the UK. How Experienced is the Solar Panel Installer? When it comes to choosing a solar panel installer the more experienced the better. Just as it is extremely important that the installer is accredited under the Microgeneration Certification Scheme, experience also accounts for a lot. So it will most certainly pay off to do a little bit of research into how long the installer has been in business for and how much experience they have installing solar panel systems. Company websites are a good place to start, as is this website. Solar Guide operates a rated service which allows our customers to rate and review our accredited solar installers and leave genuine feedback. Solar Guide features genuine verified customer reviews and ratings. We appreciate that cost is a huge deciding factor when it comes to installing solar panels. To get the best possible price we highly advise sourcing 3 quotes from our directory of accredited solar PV panel installers. Solar panel prices have fallen significantly and in 2018 solar panels cost around £6,000 – £7,000 for the average sized residential home, this is over 60% cheaper compared to what they were in 2010. This means solar panels are now more affordable than ever, especially if you compare quotes from multiple installers. And that’s great news for homeowners! Get quotes and compare prices. Most domestic residential solar panels do not require planning permission but it’s always a good idea to consult with your local council’s planning department. If the solar panels are to be fitted to a listed building or a property in a conservation area or a world heritage site then it is imperative to check with your local authority first. Knowing if your roof is suitable for solar panels ultimately comes down to the direction the roof faces, whether it is covered by shade and what it’s made from. The company installing your solar panels will usually offer two separate warranties: one which covers the product itself and one which covers the workmanship. Before going ahead with any installation, always check out the warranties and guarantees; they can vary from installer to installer. Generally speaking, the work will be covered for anything between 5 to 10 years, whilst the panels will be guaranteed for 20-25 years. Solar panels are hardwearing and are manufactured to last. You will also need to replace the inverter at some stage; most inverters come with a warranty of at least 5 years. Will I be Able to Choose a Local Solar Installer? Our directory comprises of both local and nationwide solar companies. When you submit your quote request we will endeavor to find at least one local solar installer to provide you with a quote. What Else Should I Know Before Installing Solar Panels? Solar panels are an ideal solution for environmentally conscious homeowners because they don’t generate green house gases. So by installing solar PV you’ll be doing your bit for the environment, helping to bring down carbon emissions. An average-sized solar system will enable you to cut your home’s carbon footprint by around 20%, saving around 1,000kg CO2 every year. But there’s even more savings to be had in the shape of lower utlility bills. So it’s a win-win situation all round. 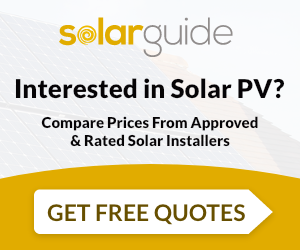 Solar Guide can source up to 3 free quotes with no-obligation at all, from our directory of accredited solar panel installers. And don’t forget to check out our top 10 tips for installing solar panels; a handy guide which provides a check list we recommend you follow should you choose to invest in what has fast become the UK’s favourite type of renewable energy technology.